It’s deadline day at Hawk Nation. The staff of the Cedar Springs High School newspaper are hunched over computers, putting final touches on their stories for the next issue. And Hailey Vinton needs help with a headline. So do many of the other 20 students who publish one of the few remaining high school newspapers in Kent County. They enjoy not only interviewing people and writing up their stories, but putting out a newspaper at a time when printed papers are in steep decline. The staff almost did not have a paper to publish this year, when the class was slated to be cut because of low enrollment. But Tamara and another editor met with administrators, recruited students over the summer and brought their case to the school board in the fall with 27 students signed up. The class was reinstated. Hills agrees, having taught the class as a first-year teacher last year. 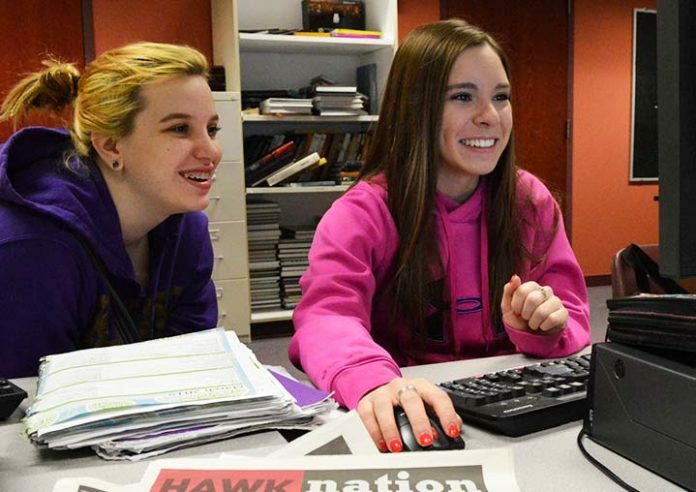 Cedar Springs is one of about half a dozen high schools in the Kent ISD with student newspapers. Others include East Grand Rapids, East Kentwood, Wyoming and all three Forest Hills high schools. Thornapple-Kellogg had one last year but its teacher left. Though some students had to drop the class this semester, the Cedar Springs staff has put out four papers so far. Two more are planned, including a special issue for seniors published by seniors on the staff. They print 950 copies at the Argus-Press in Owosso. Students tackle topics from light features and heavy issues to opinion: the distraction of phones and social media; how school officials call snow days; the pay-to-participate system for school sports; student depression and anxiety; and an editorial on drug education. You can count in Brianna Shields, a reporter who aspires to be an editor next year. “I love it, being together as a class and being able to write stories that we like,” Brianna says, as she polishes off a story on teachers’ pet peeves. Their biggest peeve is “PDA,” or public displays of affection. “That was said like seven times,” she says. Tamara Tiethoff says she likes “getting the inside scoop and being able to tell it in a fun way.” She plans to join the newspaper at Aquinas College while studying nursing there. “I enjoy how I get out of my comfort zone to go interview people (and) feeling confident about a story,” adds Katherine Krankall, a senior. Hills is honest with students about the troubled state of newspapers, calling it “an evolving field” with new ways of packaging news. “People who work hard will get jobs,” she says. Kaitlyn Evola, a copy and design editor, is interested in a newspaper career despite the challenges. “I don’t like the fact that it’s dying,” the senior says. “I’d rather sit down and read the newspaper than read online.